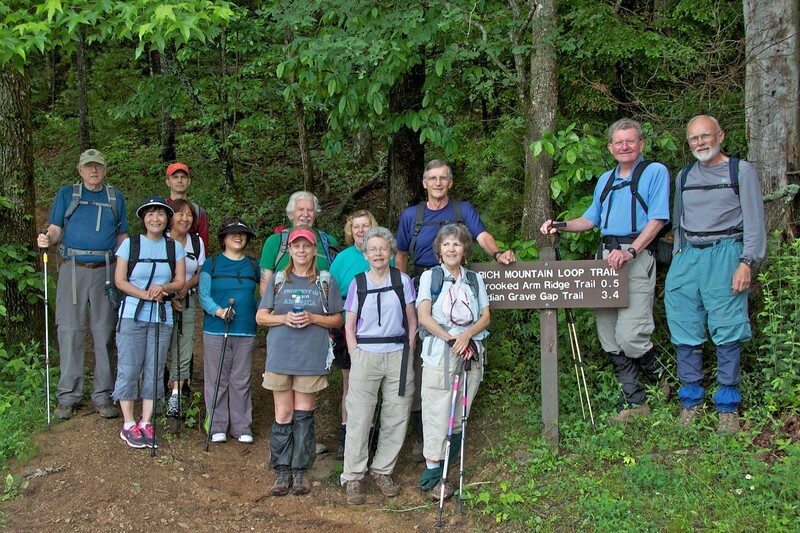 The Wednesday Group, led by Malcolm today, took on the 8.5 mile Rich Mountain Loop, in a counter-clockwise direction. Most of the elevation gain this way is done in the first two hours, then it's pretty much downhill. The views were spoiled by the cloud we were in for the first half the hike, but the compensation was the coolness provided by the cloud cover. At the trailhead, from left: Gary, Kelly, Kim, Michael (in back), Kia, Carolyn, Paul (in back), Chris, Jean, Ron B., Priscilla, Malcolm, and Bob. Ron S. is taking the picture.